Directed by Jessie Nelson. Produced by Michael London, Jessie Nelson, and Janice Williams. Written by Steven Rogers. Release date: November 13, 2015. We're still over a month away from that small holiday known as Christmas, but that hasn't stopped retail outlets and cinemas from ensuring that you know it's coming. The Christmas movies have started, the first of which is Love the Coopers, a title either missing a comma or far too strong an order for a title to be giving. That's especially true after seeing the movie, which is a painful watch from start to finish. It's incredibly difficult to love the Coopers, actually. In case you haven't figured it out, The Coopers is a somewhat large family. 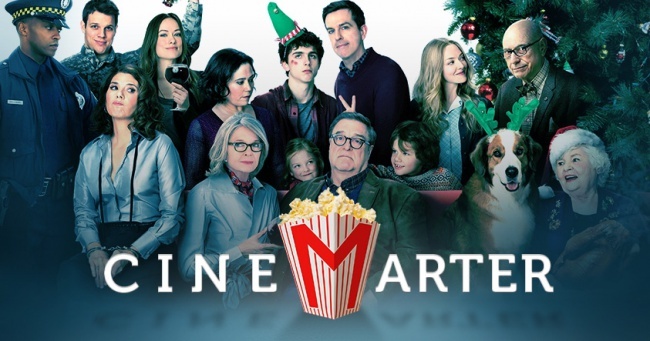 Its members come together every year for Christmas, but this year there's even more drama than usual: Charlotte and Sam (Diane Keaton and John Goodman) are about to announce they're divorcing after 40 years; Hank (Ed Helms) already split from his wife, Angie (Alex Borstein), and is also struggling to find a job after being replaced by a machine; Charlie (TimothÃ©e Chalamet) is a moody teenager who desperately wants to kiss Lauren (Molly Gordon); Bo (Maxwell Simkins) wants to find the perfect gift for Charlie, his brother, to make him less moody; Bucky (Alan Arkin) finds out that his favorite waitress, Ruby (Amanda Seyfried), is leaving the diner forever; Emma (Marisa Tomei) gets caught shoplifting and spends a good chunk of Christmas Eve in the back of a police car driven by Officer Williams (Anthony Mackie); Eleanor (Olivia Wilde) picks up a soldier at the airport (Jake Lacy), whom she convinces to pretend to be her boyfriend; and Aunt Fishy (June Squibb) is just here for the ride. If that sounds like a lot of subplots to balance, you're correct. It's a lot, and it winds up being far too much for director Jessie Nelson to balance. We jump between plots so frequently that you're likely to develop whiplash - if you don't develop it from the large tonal shifts that occur in the film. Love the Coopers hasn't got a clue what type of movie it wants to be, outside of one that features a dysfunctional family and one that eventually wants to tell you how important family is, regardless of all the problems that one may have. Is it a schmaltzy family drama? A heavy family drama? A light comedy? It doesn't know, so it bounces around from scene to scene - and sometimes within scenes - trying to find its voice. It never gets there. Love the Coopers is a predictable movie, as these home-for-the-holidays movies tend to be. You know how almost all of these subplots are going to wrap up, and if you guess that everyone will be happy and dancing at the end, you're not going to win any points for that prediction. Few of the conclusions to these subplots feel earned, with most of them ending simply because the movie needed them to, not because characters learned anything. Of course Eleanor and her fake beau will fall in love for real. Charlie will definitely get to kiss Lauren. The marriage of 40 years isn't going to disintegrate in a Christmas movie! 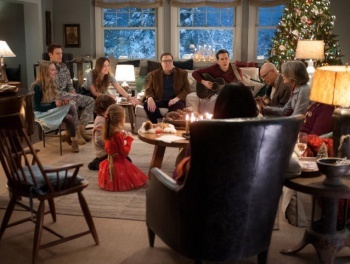 There are only so many boundaries that Love the Coopers wants to push, and none of them come in the plot. However, individual moments come close to pushing boundaries, and it's in these areas that Love the Coopers starts to come close to succeeding. Eleanor's subplot sees her and her pretend boyfriend on very different sides of the political spectrum, which leads to some genuinely funny moments from the both of them. But that doesn't come into play beyond some lines of dialogue. Meanwhile, Anthony Mackie's character is a closeted police officer, who gets a back story and everything - but then it turns out he's just a plot device to get Emma to "grow" as a character. There's an important bit of information we learn about Ruby that is shown once and then never touched upon again. Love the Coopers is a series of missed opportunities weighed down in predictable dysfunctional family garbage.